It's Eadweard J. Muybridge's 182 birthday today. Google have - and this caught me out - decided to mark his birthday with a Doodle. Perhaps I shouldn't be surprised. 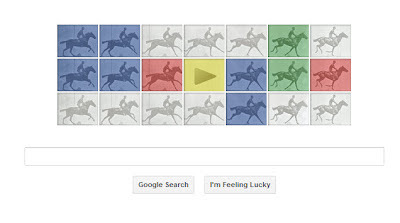 Muybridge pushed technology on in the way Google admires. Born in April 1830 and died in May 1904, Eadweard Muybridge was an English photographer who took on the "Standford and the galloping question" wherein he used photography to discover whether or not all four of a horse's hooves are off the ground at the same time during a trot. They do all leave the ground. On a slightly sour note, he was found not guilty of murder, partly due to insanity, after shooting his wife's lover.